My daughter and I love to get in the kitchen and cook together. One of our favorite things to make is grilled pizza, but rolling out the dough is time consuming and all that flour makes a huge mess of my kitchen. I love to cook and I feel good about making homemade meals for my family, but the last thing I want to do after a long day at work is sweep flour off my floor and scrape dough off my countertops. I was so excited when Krusteaz sent me samples of their new Flatbread Mix as part of our promotional campaign because I’m always looking for products that help make busy nights a little less stressful! In less than 15 minutes I have fresh dough ready to go on the grill and no more flour all over my countertops and floors! Scroll to the bottom on my post to see how you can win some flatbread mix. I used the Italian Herb flatbread mix for a savory grilled pizza featuring the flavors of summer, but you can easily adapt this recipe to use any of your family’s favorite pizza toppings. 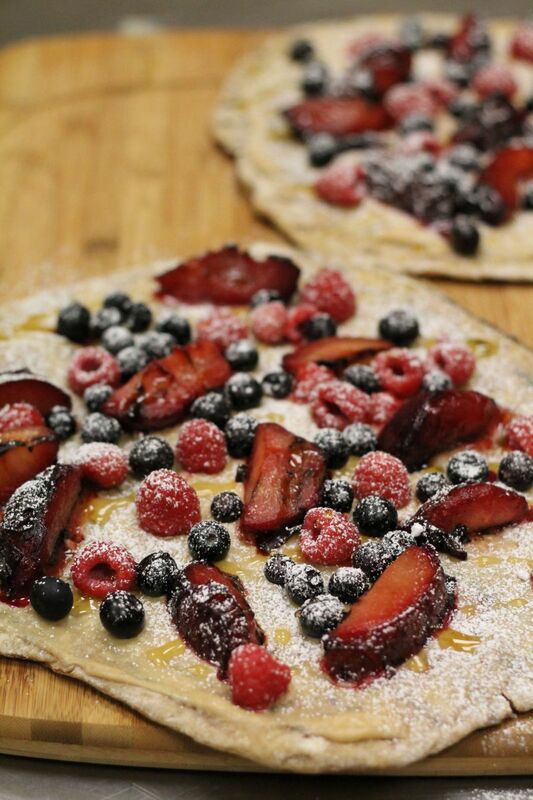 The Whole Wheat mix made the perfect crust for a healthy, dessert pizza the whole family loved. Preheat grill for direct cooking over medium heat (350 to 450 degrees). Stir together flatbread mix and yeast (enclosed). Add warm water and oil, stirring until dough forms a ball. To activate yeast, cover dough and let rest 10 minutes. Shape dough by dividing into equal portions according to desired yield. With floured hands, pat out dough 1/8 to ¼-inch thick, forming desired shape. Place dough on hot grill. Once the dough has set and grill marks appear on the bottom of the dough, about 5 minutes, use a spatula to carefully remove dough from the grill. Flip dough and place grilled side up on a cookie sheet or pizza paddle. 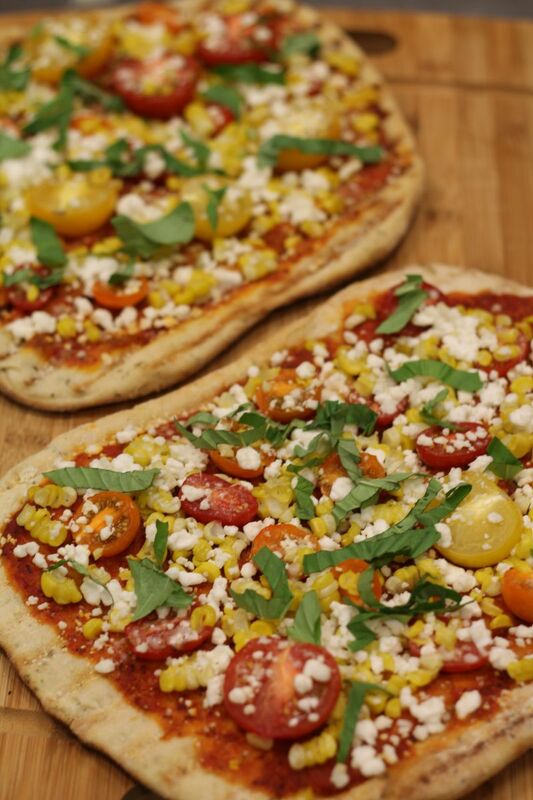 Top with a thin layer of pizza sauce, corn, tomatoes and goat cheese. Place pizza back on the grill, close lid and grill for another 3-5 minutes or until the crust has cooked through and the toppings are warm. Remove pizza from the grill, top with fresh basil, slice and serve immediately. Lightly brush cut side of plums with olive oil and place plums on the grill, cut side down, for 6-8 minutes or until golden brown and sear marks have appeared. Remove plums and let cool before cutting into slices. Place dough on hot grill. Once the dough has set and grill marks appear on the bottom of the dough, about 5 minutes, carefully flip over and grill until the dough has cooked through, about another 1-2 minutes. Using a spatula, carefully remove the dough from the grill and place on a pizza paddle or cookie sheet. Spread the cream cheese in a thick layer across the pizza and top with the fruit. Put the pizza back on the grill, close the lid and grill just to warm the fruit, about 2 minutes. Remove pizza from grill and top with powdered sugar and honey. Slice and serve immediately. Win Krusteaz Flatbread! Our friends at Krusteaz have given us enough Krusteaz Flatbread to give one GRAND PRIZE Winner 3 cases (or 36 boxes) a variety of flatbread mixes and 3 RUNNER UPS 1 case (or 12 boxes) of flatbread. Simply comment on this post and tell us why you should win. Click here for the rules. We will randomly select 1 grand prize winner and 3 runner ups on Wednesday, September 10th at 9:00am ct.
CONGRATS to our winners!! Grand prize: Dave S. Runner ups: Vikki M, Paul G and John T. Thank you for particpating!